The Irish Stone Cottage emerges from my murky basement craft room. My basement is not really murky, but it is my craft room. I’ve been working on this little house for about a week. 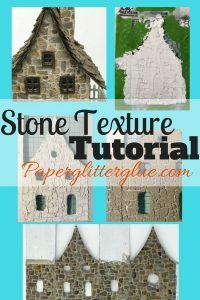 I have a tutorial on making stone textures on little houses so, of course, I needed to make some stone houses. This is the first example that I have finished. 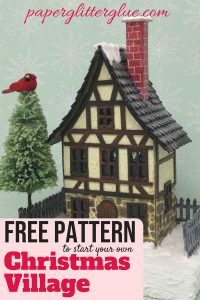 You can also find the pattern both in SVG and PDF formats for this house in the library as well. This cottage will be a part of the Halloween Houses for Habitat fundraiser even though it’s doesn’t look like Halloween right now. The house is a little drab at this time, but it will be more colorful when I decorate it for fall with brightly colored fall leaves and pumpkins. And I can always perk up the base with more color. Maybe it needs a little walkway as well. 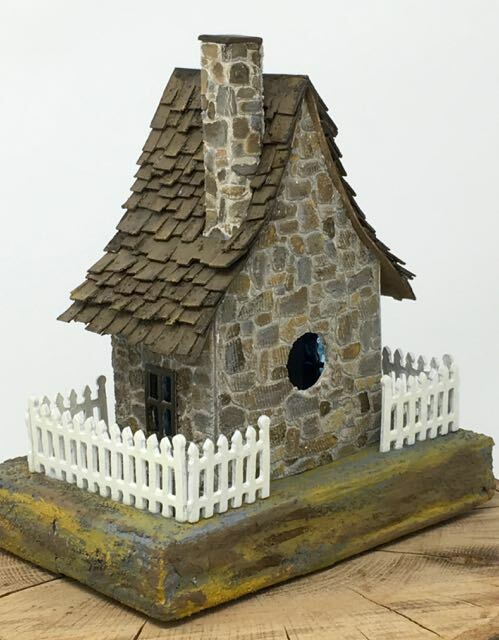 Even though it is for the Halloween fundraiser, I don’t intend to specifically decorate this little house for Halloween, I’d like to keep it seasonal rather than holiday-specific. 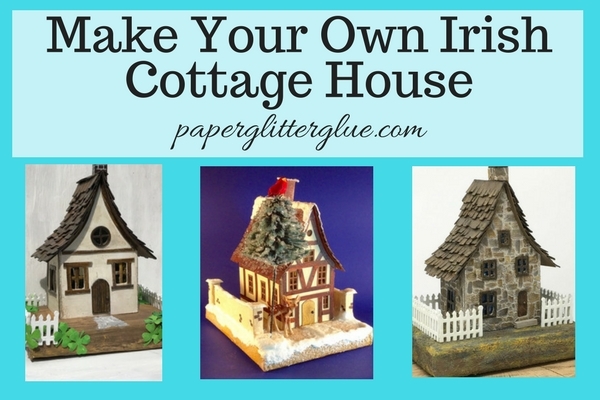 The roofline on the first Irish cottage was made by cutting individual shakes and gluing them to the roof. 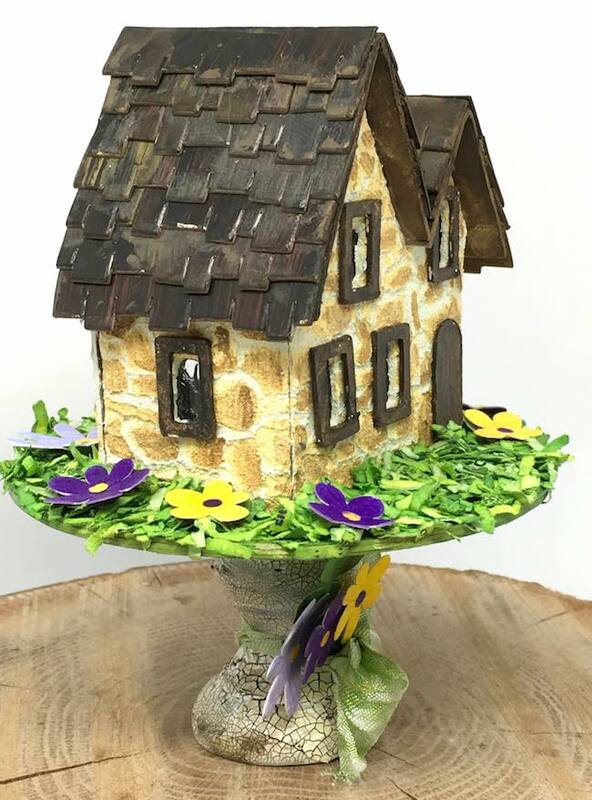 I made this stone cottage roof using the offcuts of one of the Tim Holtz Village rooftop dies. I just cut a line for each shingle and adhered the strip to the roof. It makes a much easier roof with a very similar effect. View of the back of the cottage. 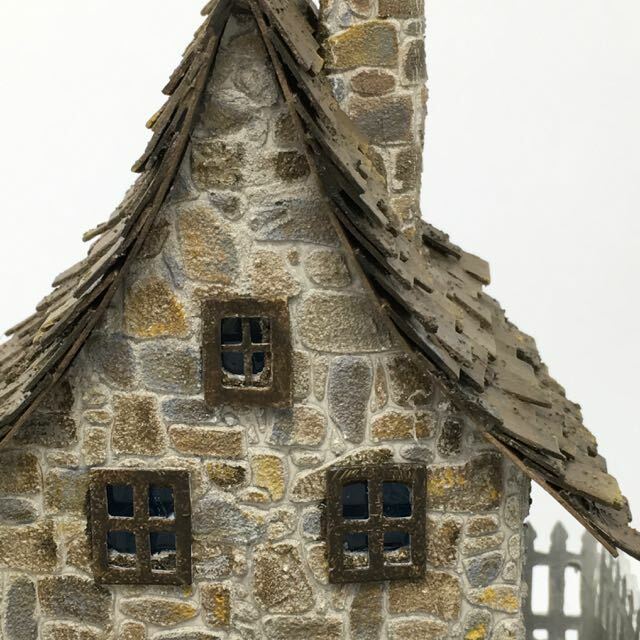 The roof shingles were glued on in strips rather than as individual shakes on the previous Irish Cottage. But the most appealing feature of the Irish Stone Cottage to me, anyway – it’s the stone surface. I love the way it looks. It takes time, but I love this technique. 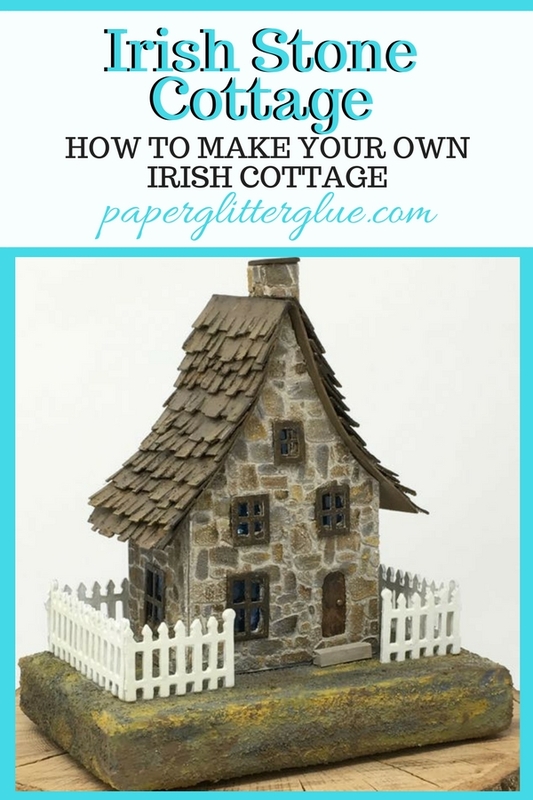 This post is basically a photo post so I can show you the completed Irish Stone Cottage. 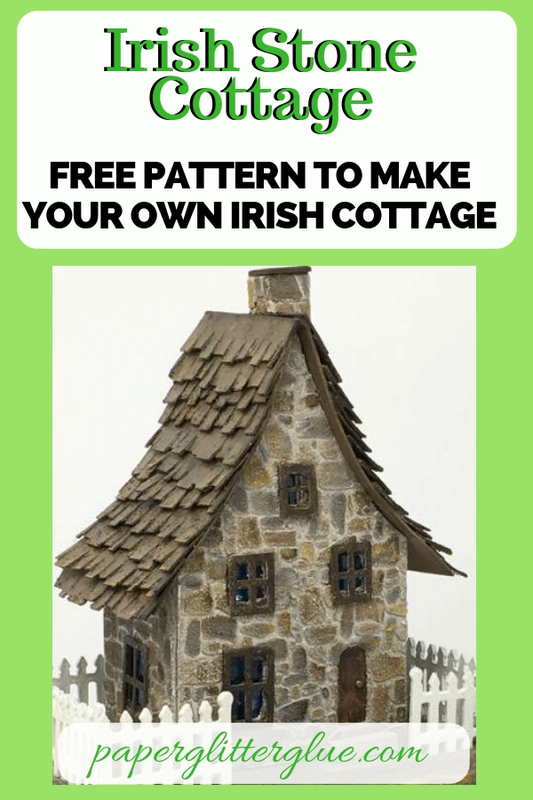 I finally completed the PDF and SVG patterns for the Irish Cottage. They are available in my paperglitterglue library for free. Just sign up below to get access to the library. 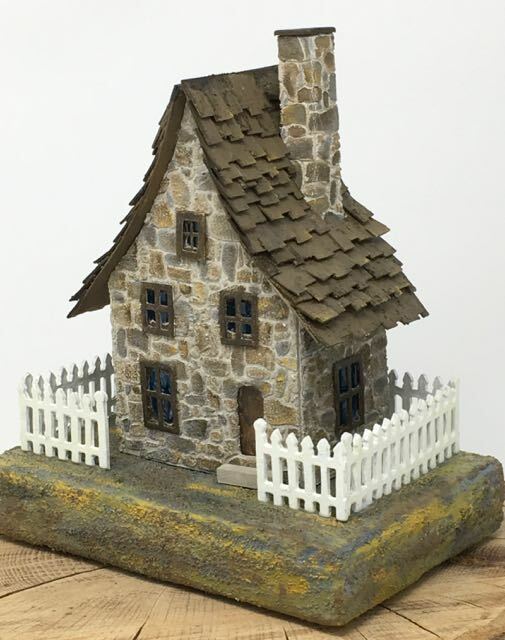 I’ll have more detailed photos on how I made this house in the Stone Texture tutorial. You can also find a free PDF of the Stone Texture Tutorial in the library as well. Once again, I found an online challenge I can enter – Simon Says Stamp Wednesday Challenge which is “Anything Goes”. I am happy to be able to enter at least one challenge with my project this week. I love to see what everyone creates for these challenges. Thank you for stopping by. I love to hear from you. What are you creating this week? P.S. 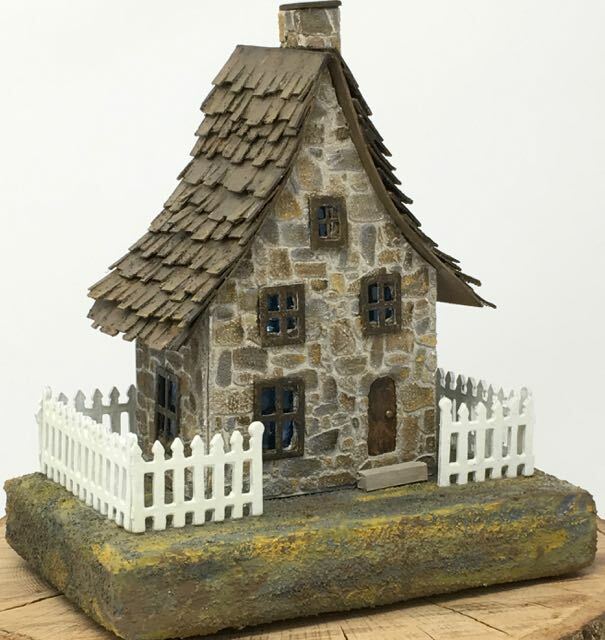 Here is the latest – a Miniature Irish Stone Cottage. Pin to your favorite board if you would like to remember where you’ve found this little cottage. Very Cool!! I Love it!! Your work is amazing….God Bless your hands!!! Lucy, your sweet stone house is charming! Regarding curves, I thought of the tool used in dressmaking patterns, the French curve. It is a cross-over tool useful for various hobbies where equal curves are required. It is handy when designing hand bags, for instance, and anything that is to be curved and painted or cut. Perhaps I am preaching to the choir and have a favorite tool but I wanted to mention it. I am eager to read your tutorial on faux stone. Best to you. That is a brilliant idea. I know what you are talking about, but I’ve never used in my sewing since I mainly sew straight lines and don’t make patterns. 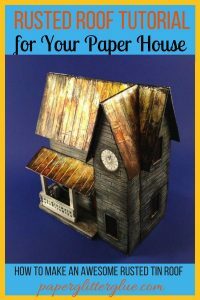 It is perfect for making this paper pattern. I will go out this afternoon and buy one. Eventually I hope to learn an online program for making, but it is tiresome to have to learn a new computer program. Thank you so much for suggesting this. You have helped me a lot. You are so welcome. JoAnn’s (sp?) with a 40 or 50% coupon is just the thing! I am eager to hear how it works for you. Loretta, I bought one. It helps so much for the patterns. Thank you. Oh what a delight! I love everything about it, and I hope you’ll share it again when it is finally finished for fall! Thank you for playing with us at the Simon Says Stamp Wednesday challenge! Thank you, Lin. 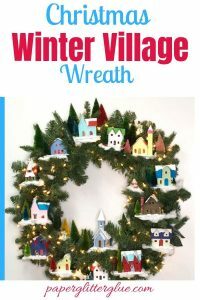 I was so happy when I found that the Simon Says Stamp Wednesday challenge was “Anything Goes” because there wouldn’t be many challenges where this project would fit. I will be sure to post it again when it is totally decorated. This house looks so nice! The recessed front door is a great realistic touch! And the roof is amazing. I think I’m going to add some red color to the door to make it pop! a little better. The roof was actually one of my simpler roofs because I didn’t really have to piece it together. The roof width was less than 3 inches, the width of the die. So I just glued them on. I did paint the shingle strips several layers to get a color I liked. I can see rose bushes and the Duke and Maureen O’Hara sitting on a stone wall around it. Thank you for the lesson and the memories. I hope you will try it. It’s always been one of my very favorite houses.